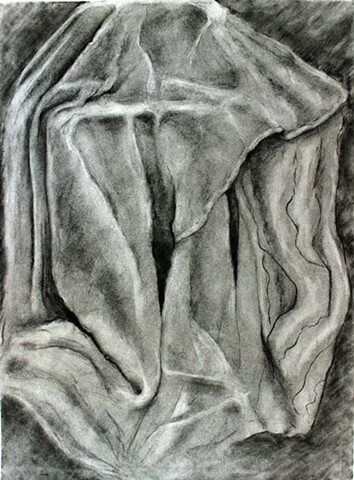 This drawing utilizes the Subtractive Method which is a drawing technique using charcoal as its media. The objective is to identify, draw, and blend a wide range of values. Instead of adding values in only areas that are darker, an entire sheet of paper is covered with a mid-tone layer of charcoal. The student first removes the lightest values, then reintroduces darker values by layering more mid-tones on the mid-tone that already exists on the paper. Sophisticated rendering of value is attained by continuing to layer mid-tones until darks begin to appear. It was completed during the Observational Drawing course at Santa Fe Preparatory School, Fall 2015.